Visit and like the Facebook application page to be informed about new features. You can there also ask for a new feature or report a bug! The main screen contains all you need for every flight. The actual situation, the way to fly (flight plan / turn points) and the way home (if required). It shows net flight time in format m:ss. It also shows a `+` sign behind the time to indicate flight mode. The flight mode is set automatically when the GPS speed exceeds 2.5 m/s. And it’s finished when the speed falls below this threshold for more than 30 seconds. This is actual altitude read either from GPS sensor or from barometric sensor (pressure altitude). The GPS altitude has a static bug which you need to balance in the application Settings via the GPS altitude correction item. For central Europe it’s -50 meters. When using pressure altitude it’s necessary to set correct QNH in the respective Settings option. This is very simple variometer. It simply compares actual and previous altitude and shows the difference. Current GPS ground speed indicator. Actual geigraphical track in degrees. The mode could is being switched by the next ‘Time to next TP’ view. It shows the time based on current speed and also direction. When flying directly to the point the time is just the distance divided by the speed. Otherwise it takes into consideration the direction deviation up to an ‘infinity’ (99:59) when the time is higher or it shows ‘—‘ when flying off the point. This is just a note indicating status of the GPS receiver and its accuracy. The menus andother application functionality is described in other web pages (see the top menu). Overall flight plan progress. It shows flight start / take off point as the bottom red dot, destination as the top green/red dot and list of intermediate turn points in between. Red dots and bars represent passed turn points and legs. Yellow bar represents current leg. Green dots represent next turn points and destination. The map view shows actual flight situation. It’s built on top of Google maps. As you can see the map view could be displayed in 2 different themes – the dark one and the light one. It’s on you to choose what’s better for you in the application Settings screen via Dark map theme option. This is your current location. During the flight it’s normally shown in the center of the view. You can move and zoom (limited zoom levels) the map at any time. There is a timer configurable in the Settings screen called Map location timer which always returns the view to your current location after configured number of seconds. It could be switched off by setting a zero value (not recommended). This is a speed vector divided into 2 parts indicating your position in one, two and three minutes if flying the current speed and direction. This is a standard Google map icon which moves the map view back to your location (without waiting for the timer mentioned in previous point). This indicator is only shown if the map view is NOT oriented to the north. Click on it to rotate the view back to the north. You can switch between north and flight direction modes by clicking to the GPS track view (see the Main screen section, item 6) GPS track above). The AMSL / AGL altitude units correspond to the unit chosen by the GPS altitude view (see the Main screen, item 3) GPS altitude). You can manually de/activate temporary restricted / segregated areas in the Air space setup screen. The areas set as inactive are shown in italic. The yellow path shows your flight path from take-off to landing. One flight could be compound of multiple flight segments (you can land, move and then take-off again). The segments are connected with a direct dotted yellow path. Any movement between the segments is not being recorded. You can store/save and start new flight in the Flight menu. The red and blue points show the take-off (red) and landing (blue) locations. Your flight could be compound of multiple segments where each of them has its own take-off and landing point. When you click on them you’ll see time if the take-off / landing. The green line shows your flight plan – the list of turn points defined in the Flight plan menu. The line always starts in your actual location and points to the next turn point. If the flight plan is empty, it’s not shown. When flying the turn points are automatically switched once you reach the actual turn point at the configured distance. Check the Settings screen, the FP turn point radius option. The Main screen views Next TP / destination distance and Time to next TP / destination show distance and time (when flying towards) of the next turn point or to the final destination (green). The green spots show the turn points. When you click on them you’ll see the spot name. The red line shows you direct way to “home”, to your take-off point. The Main screen views Start distance and Time to start show distance and time (when flying towards) of the “home” location (red). When the Real Time Tracking is on you can see other pilots as the yellow circles (when on ground) or arrows (when flying) indicating direction of flying. When you download the application it works in a free mode. It has full functionality, just some small pieces are disabled. You can enable them by buying a full version. You can do it directly inside the application in the respective Full version menu. It will cost you a value of approximately 8 bucks a year. I believe that this is a reasonable price for such tool. It will help further development and support of the application. The Full version is being managed by Goole Play services as a yearly subscription. In order to purchase a subscription your credit card has to have enabled so called MO/TO payments. If your payment fails, check your card settings in your internet banking or in your bank / card issuer and enable the MO/TO payments. Use the application - plan a flight... and fly! This is a set of hints or recommendations on how to use the application, how to prepare your flight and how to use the application during the flight. The text is NOT a comprehensive list of actions you should do. You are a licensed pilot so you know how to prepare for your flight! Just watch the main screen – you have all the information you need for your flight on one place – on the screen. However of course the application is fully interactive during the flight so you can do whatever you want (except few intentionally disabled functions)… and you can be sure that the application will always return back to the main screen with your position in the middle of the map view. 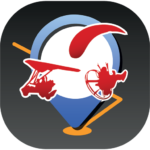 Please note that the Aviator mobile application is provided AS IS without warranty of any kind. This application doesn’t fulfill any formal requirements and/or regulations and can’t be formally used as a replacement of officially required flight equipment! Author of the application and this web site does NOT accept any responsibility or liability related to using the application. The application is using device's non-certified and potentially non-precision GPS and similarly potentially non-precission pressure sensors sensors for all the positioning and movement data (location, altitude, speed, bearing, climb/descend rate) with all the possible consequences of this fact (e.g. entering controlled / restricted area without permission). Please realize what type of altitude you are using and displaying on screen. When using GPS altitude it's more or less OK below the transition level, it\'s however definitely not OK above the transition altitude (where airplanes use flight levels on standard QNH 1013 hPa / 29.92 inHg instead of AMSL altitude) - especially when flying close to bottom border of a controlled airspace and in low pressure weather (below the standard pressure). When using pressure altitude don't forget to set correct local (area) or standard QNH in the settings! The installed air space file might not correspond to the real air space configuration. There is no (free!) automatic and reliable update functionality implemented. Always verify your flight plan against the official materials of your national aviation authorities, check actual status of all relevant temporary restricted / segregated areas, check NOTAMs, local procedures etc. This application does NOT contain such information!